THOUSAND OAKS, Calif. (AP) — The Los Angeles Rams looked like a team that could be playing for a long time based on how they put away the Oakland Raiders in the second half of the teams' season opener. With an eye toward possibly playing into February, coach Sean McVay is willing to play the game to make sure the Rams are physically ready. McVay preemptively canceled Wednesday's practice to give his team extra time to recover from a physically taxing 33-13 win at Oakland on Monday night, planning instead to hold a walkthrough similar to what the Rams did late last season in his first year in charge. Later in the week he will be ramping up the physicality heading into the team's home opener against the Arizona Cardinals on Sunday. "We always try to do what is best for the players, and I think when you take into account what a physical game that was — that's a physical football team that we played last night — we feel like we've got the kind of team where we're mature enough to be able to handle a mental day if we feel like that's going to be best for them getting their bodies, getting their legs back underneath them for a good Thursday and Friday, and then hopefully being ready to go on Sunday against the Cardinals," McVay said Tuesday. That approach would seem to make sense after the Rams showed they can overcome a slow start against the Raiders. In addition to outscoring Oakland 23-0 in the second half, Los Angeles also had a 267-141 yardage advantage and held the ball for exactly 20 minutes. The Rams defense intercepted Raiders quarterback Derek Carr twice and did a better job of adjusting to Oakland's use of tempo and formation in their first game under returning head coach Jon Gruden, something McVay credited to the adjustments made by players and defensive coordinator Wade Phillips. 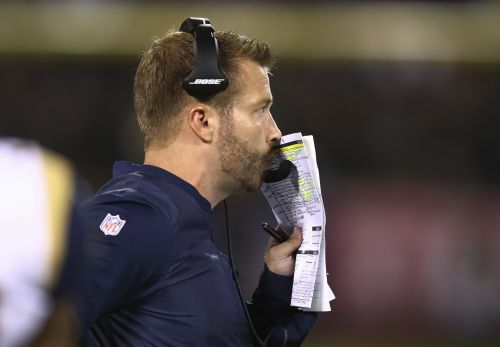 "I think to be able to go through some adversity says a lot about our football team," McVay said. "When you take into account the elements, the atmosphere, some of the unknown with what they presented offensively, even some different things defensively, the way that the half ended they had a lot of momentum. I thought our guys really embodied that attitude of never flinching, never blinking, and then they came out and did an excellent job in the second half." They also showed an improved understanding of how opponents might attack a Los Angeles defense supercharged by the offseason additions of defensive lineman Ndamukong Suh and cornerbacks Aqib Talib and Marcus Peters. Oakland used a heavy dose of bruising running back Marshawn Lynch in an effort to keep the Rams from getting chances to rush the quarterback, while tight end Jared Cook was the focus of the passing game with Raiders receivers held under wraps by the star defensive backs. Despite their struggles in a 24-6 loss to Washington, Arizona has the personnel to try and replicate Oakland's approach. David Johnson is a proven asset carrying the ball or catching it out of the backfield, and tight end Ricky Seals-Jones showed signs of being a difference-maker in the passing game as a rookie. The two Cardinals targets are the kind of players the Rams might try to limit with linebacker Mark Barron, but McVay was uncertain whether he would be available after not playing against Oakland because of an ankle injury. "He's kind of day-to-day right now," McVay said. "It's such a tough thing as far as being able to really project and predict what he's going to be able to do. Whether he is going to be available or not right now I think is definitely questionable and I'll probably have a little bit more information about that as we go forward, but I thought Ramik (Wilson) did a nice job stepping up. You see Marqui Christian get a lot of reps in some of those known passing situations, and I thought both those two players were good for us last night." NOTES: Return specialist Pharoh Cooper is expected to miss several weeks because of a sprained ankle that McVay said might need to be repaired surgically. The Rams might be forced to sign a replacement for Cooper this week as his backup, wide receiver Mike Thomas, is dealing with a groin injury that McVay said could also sideline him.